Movie Interview - David Chase, Director Of 'Not Fade Away' In his new film, Sopranos creator David Chase tells a coming-of-age story about Jersey boys in the 1960s who dream of riding the wave of the British invasion all the way to stardom. Chase teams up with Steven Van Zandt — of the E Street Band and The Sopranos — to make the movie's music rock. 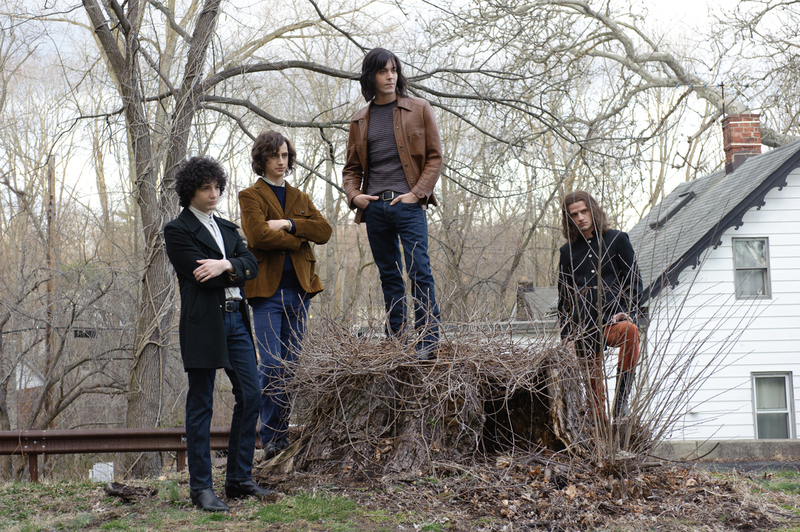 John Magaro (left), Brahm Vaccarella, Jack Huston and Will Brill play aspiring rock stars in Not Fade Away. 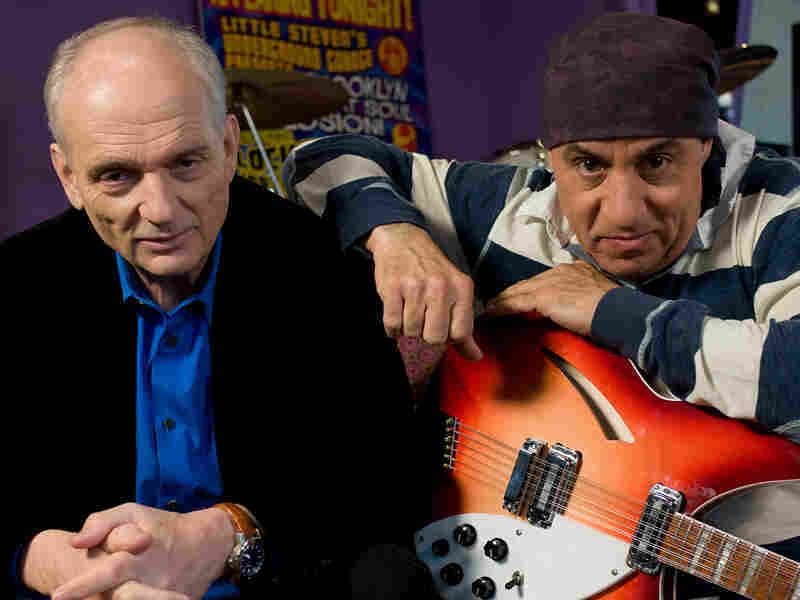 In some ways, the film Not Fade Away is an extension of the friendship between the film's writer and director, David Chase, and its executive producer and musical supervisor, Steven Van Zandt. Chase, the creator of The Sopranos, first encountered Van Zandt on TV, when Van Zandt introduced the Rascals to the Rock 'n' Roll Hall of Fame. Chase soon cast Van Zandt as Silvio Dante on The Sopranos, and the two became close, bonding in particular over their love of pop music from the 1960s. "[We'd] go out to dinner with our wives, and that's all we'd talk about," Chase tells Fresh Air's Terry Gross. "And in some way this movie is an extension — is a logical outgrowth — of those conversations. We continued these conversations into when I was considering writing the script. We kept talking about the music, and it went from that kind of a conversation to a more structured, serious conversation about what the movie [should] be about." Not Fade Away follows several New Jersey boys who start a band and dream of riding the wave of the British invasion to stardom. The idea sprang from Chase's own memories of what it was like to be in a band in high school during that time, even though the only time they ever played in public was at the Newport Folk Festival — on their picnic blanket. While Not Fade Away is a coming-of-age story, it is also an ode to the era and the music that exploded onto the airwaves during that time: the Beatles, The Who, the Rascals, Bo Diddley, Nancy Sinatra, the Moody Blues, Van Morrison, James Brown, Buddy Holly, Bob Dylan and the Rolling Stones. "People get so tired of the '60s," says Chase, poking fun at the decade's popularity in the cultural memory. " 'The '60s, all right, you boomers with your crap.' 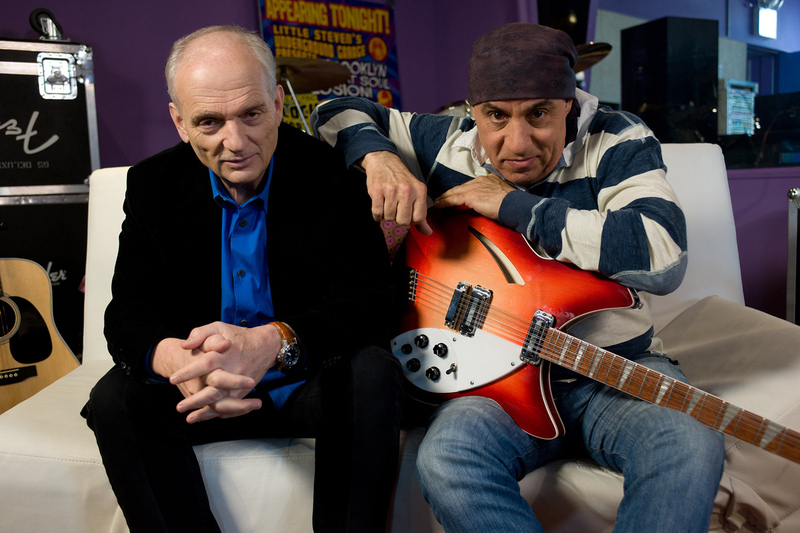 "
Director David Chase and Executive Producer and Music Supervisor Steve Van Zandt on the set of Not Fade Away. "I, on other hand, feel the '60s are underappreciated," he says. "There's at least five great TV series waiting to happen from the '60s, and countless movies, still." David Chase on the Rolling Stones song "Tell Me"
" 'Tell Me' is maybe my favorite song of all time. ... Certainly one of my favorite ballads, yeah. Ever since I first heard it, it really strikes a chord with me. ... I bought that first England's Newest Hit Makers record — the first [Rolling Stones] album — and I had a tape recorder and I did an air patch between the microphone of the tape recorder and the speaker of this turntable, and I would press play on the tape recorder and drop the needle on Keith Richards' guitar solo from 'Tell Me,' and we'd get to the end and I'd push 'stop' and then I'd drop the needle back, and so I had an endless loop of that guitar solo, just over and over and over and over again." Steven Van Zandt on "Tell Me"
"There are sounds in 'Tell Me' that I don't know how it was done to this day. ... There's odd things that Bill Wyman's doing and Brian Jones is doing that ... because they're so mono — which is how God intended, of course — ... you don't quite have the clarity to know who's exactly doing what. And I love that mystery. Mystery is extraordinarily important. ... You lose the magic when things become too clear, too obvious." "I just thought a song about a surgical supply store would be about as dismal as you could get. [I] used to go back and forth between New Jersey and New York and Boston ... all the time, and there was a company somewhere in Boston ... called Anderson Little, and the jingle was (singing) 'Anderson Little, dadadadada, Anderson Little, Anderson Little for you and for me', and I thought, 'What the f- - -? What are these people talking about, iron lungs and stuff?' And I just thought, 'Remember that,' when it was time to do this jingle." "I was trying to write the ticket, and it wasn't happening. I didn't want to make a big splashy action movie ... [but] one of my goals was this movie, and another of my goals was to do a psychological thriller or some kind of taut crime drama. And that's what Steven said I should do; that's what my friend Terry Winter said I should do. I believe my wife said that's what I should do. And all that pressure made it such that the idea just wasn't coming, but this one was there. "And then something I've realized in the last couple weeks — one of the impulse for this — [it] was right around that time was when Keith Richards fell out of that palm tree, and he was very seriously injured and I thought to myself, 'Wow, and how old are they now? How old am I now?' So this music that was like — I don't know what you'd call it — the apotheosis of youth, that the people who made it were fading away, that [Richards] might not recover from that, and that some of them were gone already. ... I wanted to sort of document what those moments had been like when it was happening, when we were all kids." "But the idea of longevity was ... introduced at the same time as [rock 'n' roll] became an art form, you know, and so the audience was able to grow up with the artists and maintain a relationship with the artist for decades, which would have been unthinkable in the '50s and early '60s, and it's really a wonderful, wonderful addition to our culture. So growing old now in rock 'n' roll is going to be a normal way of looking at it, thanks to the Rolling Stones, Paul McCartney and Ringo [Starr], who are still out there ... the guys who literally wrote the book on the art form." In talking about a surgical supply jingle he heard a long time ago in Boston, David Chase misremembered the company responsible for the jingle as Anderson Little. Anderson Little is actually a clothing store. We're not sure what the surgical supply company was.